Hello, friends! I hope you are having a fabulous week. 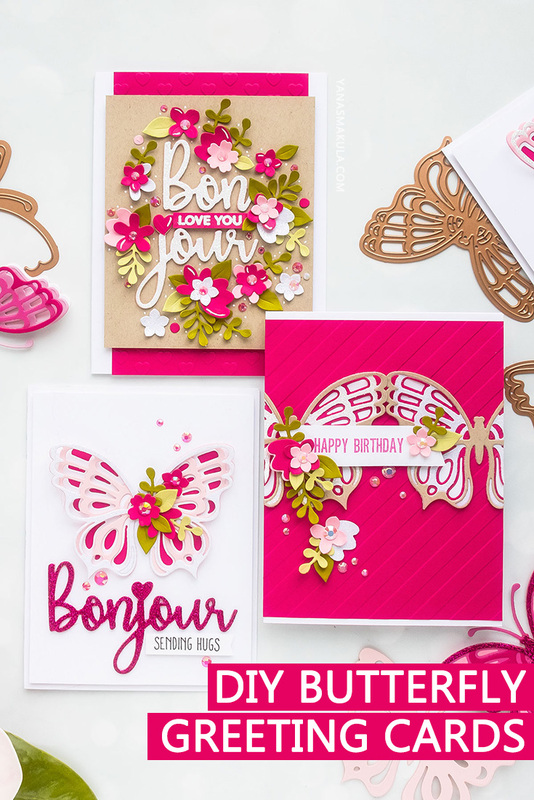 I’m excited to share the new February 2019 Large Die of the Month from Spellbinders – it’s a layering butterfly set! Beautifully designed and oh so perfect for handmade cards (and even home decor, too). 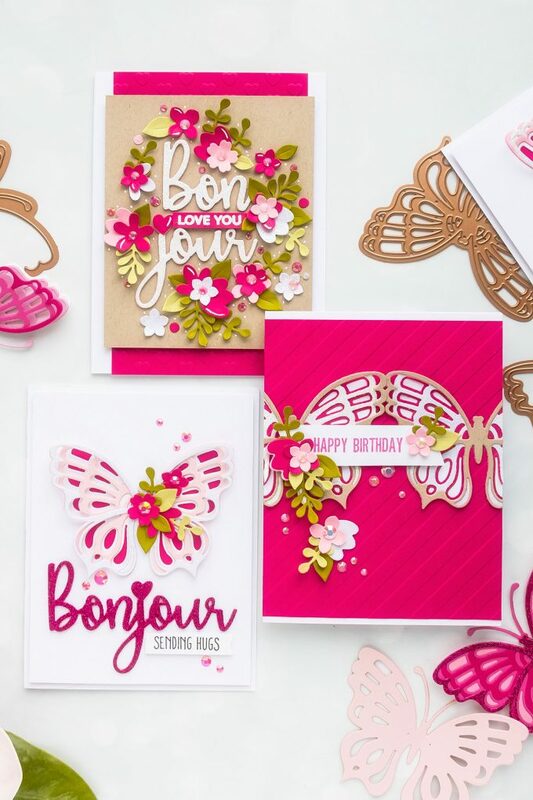 If you follow Spellbinders blog, chances are, you’ve already seen these cards. But if you don’t – you are in luck! I’m sharing them in detail below. Enjoy! For my first card, Birthday Wishes, I decided to position 2 butterflies in a row on my card front. I die-cut one of the inner butterfly layers in a hot pink cardstock panel cut to 4 1/4 x 5″. To add some texture and interest to this background I also dry embossed it using the Love Stripe embossing folder from FSJ. I’ve been loving this embossing folder lately – it’s basic in design, but very versatile and works for a number of occasions. Next, I die-cut additional butterfly layers from white glitter and kraft cardstock. After adhering the layers in place I trimmed the excess and adhered the pink panel onto an A2 white side folding card base. 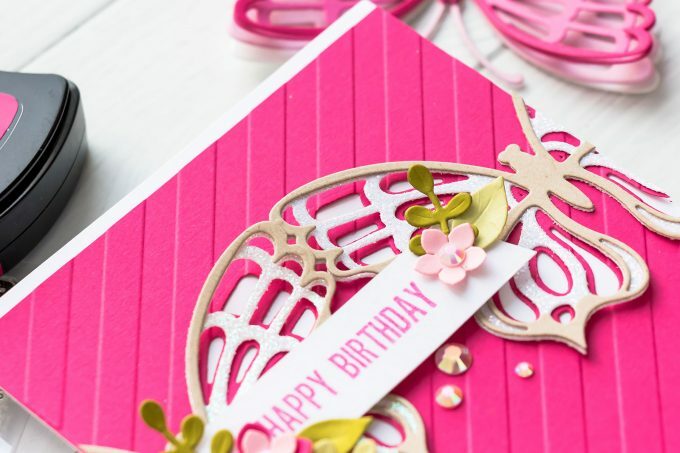 I wanted to make this into a Birthday card, so I stamped “Happy Birthday” sentiment in Scallop Shell ink from Jane Davenport and Spellbinders. I trimmed it into a skinny strip and adhered onto the card overlapping the two butterflies. 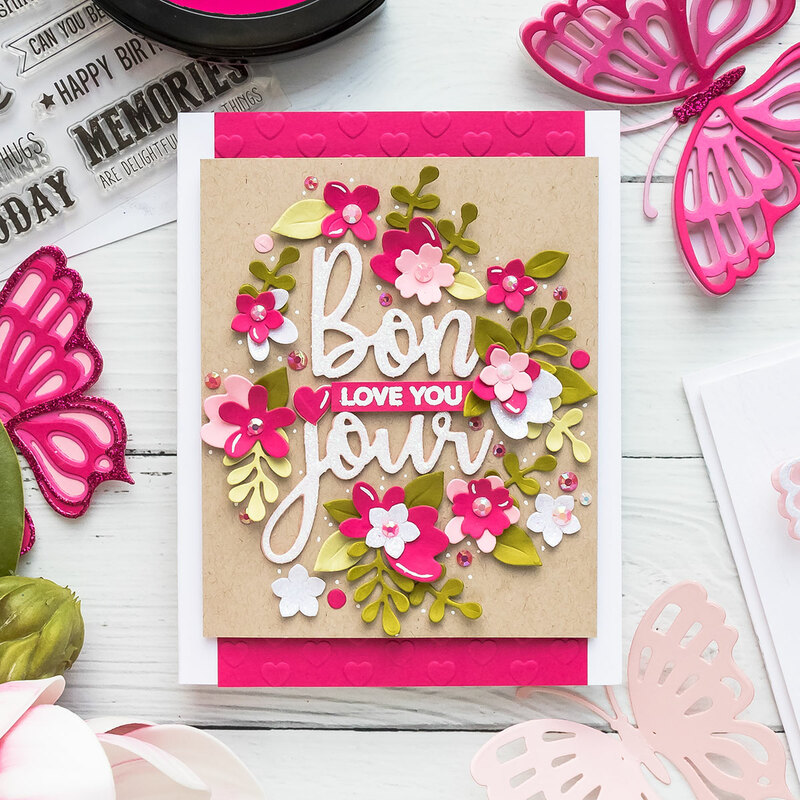 The Large Die of the Month this month features not only the butterfly die cut, but also a bunch of small flowers and sprigs. I cut several from pale pink, hot pink, white glitter and two shades of green cardstock. After shaping each with the largest stylus tip and my Tool ‘n One I adhered them onto the card dressing my butterflies up. Lastly, I embellished this card using beautiful jewels from the Valentine Jewel Mix from Pretty Pink Posh. For my 2nd card, Bonjour – Love You, I decided to split the word Bonjour (it’s French for “Hello”) into 2 pieces and create a floral wreath around it. It you look at the second, close up photo of this card, you’ll notice I created a dimensional Bonjour die cut by stacking several die cuts one on top of the other. I also used my white gel pen and added many white accents to the flowers as well as tiny white dots on the background in between the florals and jewels. 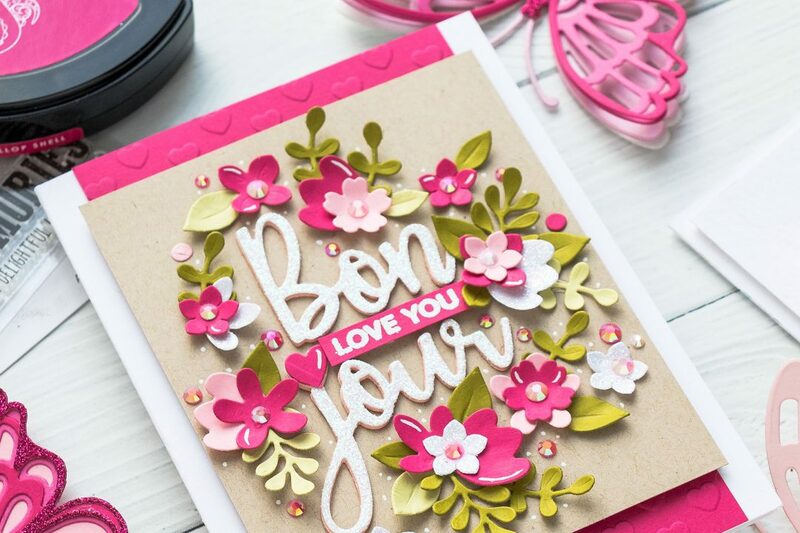 To make the background of my card interesting, I dry embossed a panel of hot pink cardstock with the help of hearts embossing folder from FSJ. 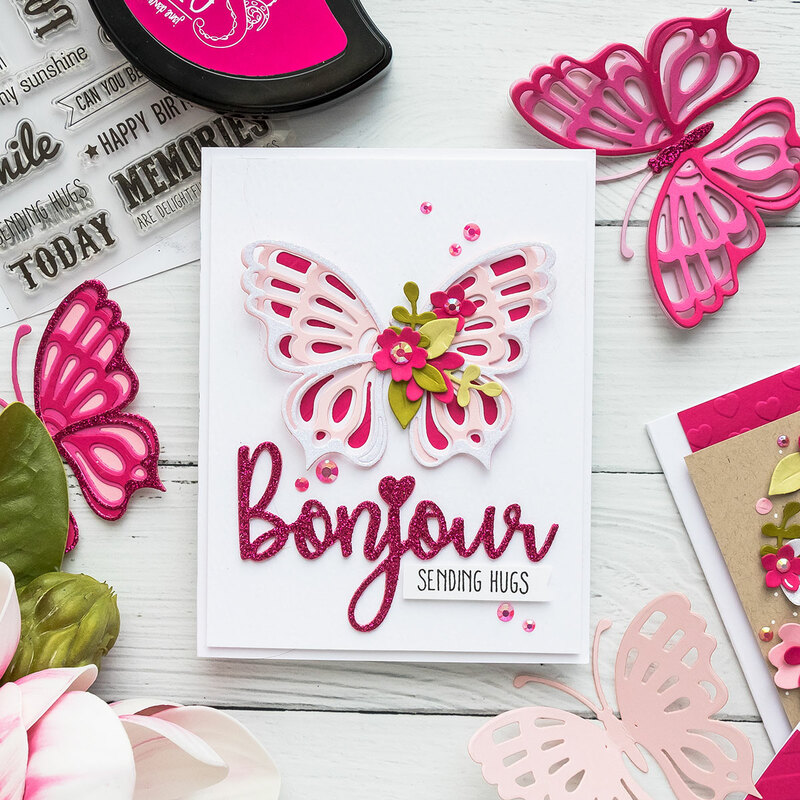 My last card for today features a classic use of this die set – I created a big beautiful butterfly and added a glittery “Bonjour” underneath. Once again, I die-cut one of the butterfly layers in the front panel and matted hot pink cardstock under it. The remaining 2 layers were cut out of light pink and white glitter cardstock. 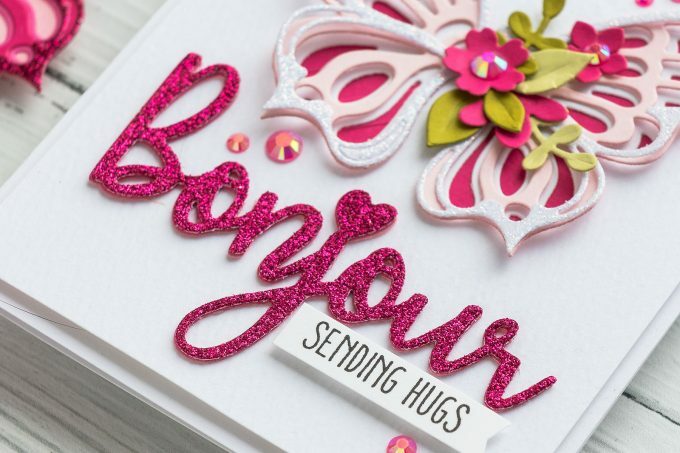 I used some pretty hot pink glitter paper to die cut Bonjour and also stamped “Sending Hugs” in Spellbinders Cave Black ink. 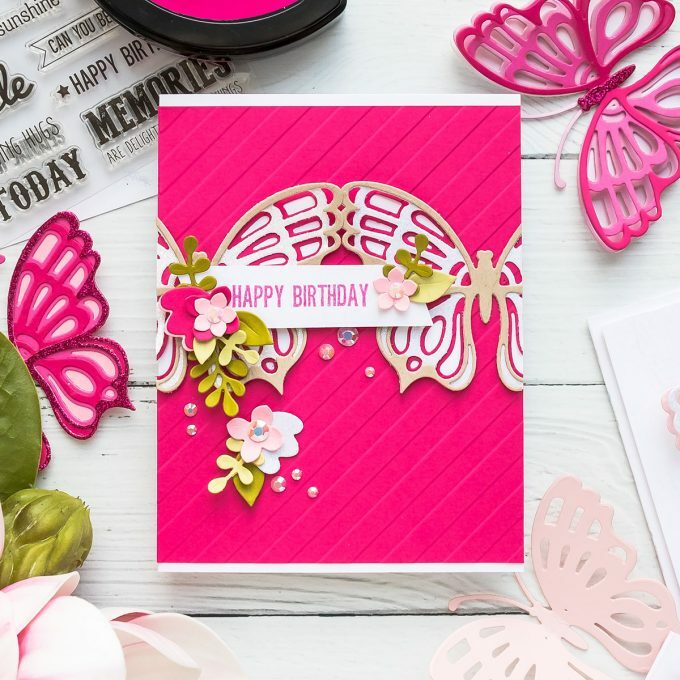 Similar to the other 2 cards, this card was completed using pretty pink jewels. Spellbinders Club is a membership subscription program, you can join or cancel anytime. There’s no yearly commitment and you can also skip month if you don’t like specific designs. It’s a very flexible Club and there are many Club options available, there are single, individual clubs and Value Clubs if you want to join several subscription at a time. Stunning! LOVE LOVE LOVE the color combo! Gorgeous photography layout and gorgeous cards Yana. You do this like no one else! Your cards are so beautiful, Yana! Can’t wait to get my large die of the month to play with the gorgeous butterfly.